We would like to update you on our recent activities that went as planned. Our cooperation with the Tata Steel tournament in Wijk aan Zee saw three of our Premiums obtain wild cards. GM Matlakov played in the Masters, GM Gordievsky in the Challengers and GM Krasenkow got the veteran’s spot in the Challengers. At the end of January in the “best open in the world” according to your votes, the Tradewise Gibraltar, we had 5 wild cards: GM Vitiugov, WGM Goryachkina, WGM Paethz, WGM Batsiashvili, and GM Khotenashvili. Additionally, thanks to the generous sponsorship from the Archibaldchess company we added 5000 EUR to the prize fund, aimed entirely at our own members. We would like to thank Archibaldchess again for supporting our cause and we are looking forward to our continuous future cooperation. We would also like to remind you of the upcoming major European events. We will also have special prizes for ACP Premiums in the upcoming European ACP Women’s Rapid and Blitz Championship, to be held in Tbilisi (Georgia) March 29- April 2. 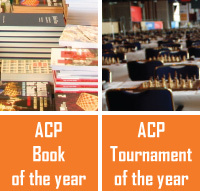 The company Archibaldchess is allocating 5000 EUR to this event and we would once again like to thank them. The ACP has also managed to secure conditions for no less than 8 ACP Premiums. This year’s cooperation with The Chess.com Isle of Man Internationalincludes 5 wild cards (3 for men and 2 for women). The recipients will be announced at a later time since the wild cards for men will be distributed according to the ACP Tour Standings on March 31 and those for women according to the standings on May 31. Our Premium member GM Alexey Shirov has been having issues with the Latvian Chess Federation and on our page we are publishing his open letter to FIDE. You can read the whole letter here.